Adidas Originals is celebrating Oktoberfest by re-launching their classic adidas München sneakers, but with some very special additions. The premium leather uppers on the Munchen Oktoberfests have a special DPBR coating that protects them from beer spillage and barf splatters. In fact, DPBR stands for Durable Puke- and Beer-Repellent. That’s right — the ultimate party sneakers. 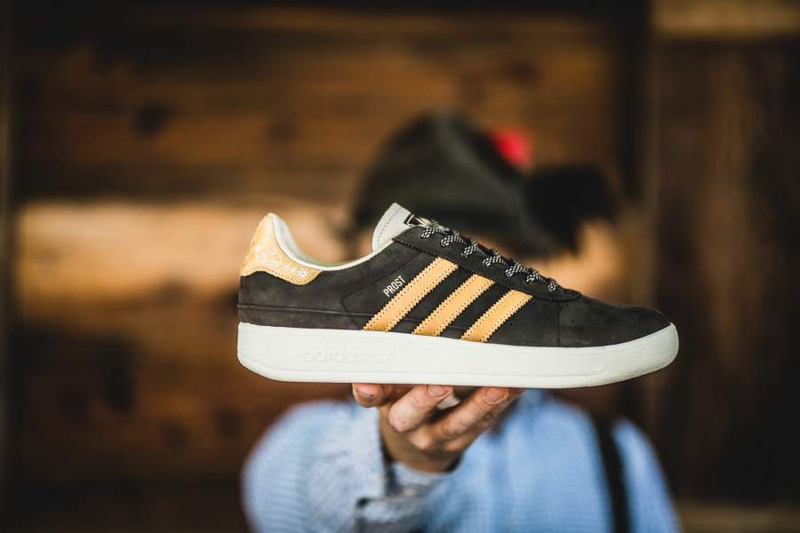 Beyond the beer- and barf-proofing, the adidas Originals München Oktoberfest ($240) feature a rich brown colorway, with the classic adidas stripes in a light golden brown along with the word Prost (“cheers” in German) stamped along the sides. The heel tab features embroidery that echoes the kind you’d find on the traditional leather pants worn during Oktoberfest and the inside is lined with a microcheck in red and white, reminiscent of a beer garden tablecloth. Oh yeah, and they have speckled laces. Yeah, speckled laces. There’s also a custom beer mug that comes with them so you can test them out yourself. We don’t recommend you drink enough to learn just how puke repellent they actually are. These booze-proof kicks are available online from respected European retailers such as 43einhalb and size?, but they’ll ship to the US.